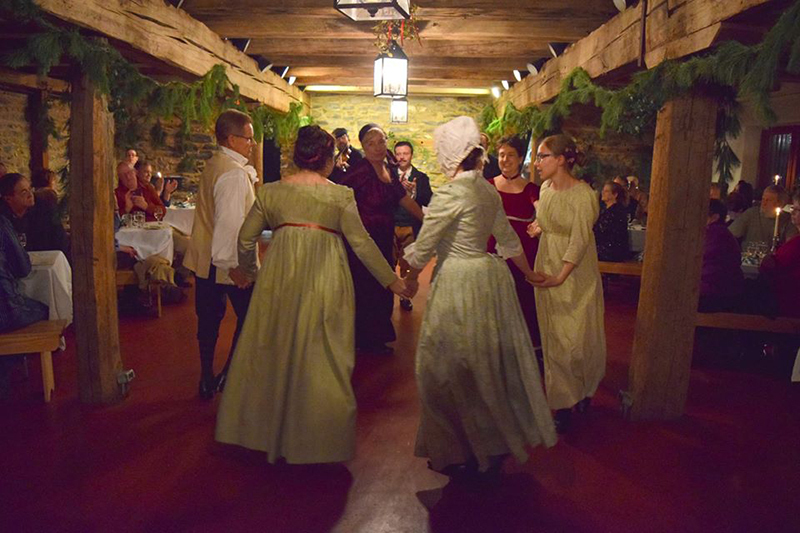 The start of December brings the season of Fezziwig Balls, like the one The Commonwealth Vintage Dancers hosts each year. The night is filled with 19th century carols, refreshments, and dancing as guests step back in time. Fezziwig Balls are named after Mr. Fezziwig, the employer of A Christmas Carol’s Ebenezer Scrooge when he was young. In Charles Dickens’ story, the Ghost of Christmas Past takes Scrooge to visit Mr. Fezziwig’s home where he is having a party. “Say that his power lies in words and looks; in things so slight andinsignificant that it is possible to add and count ‘em up: what then? The happiness he gives is quite as great as if it cost a fortune”, Scrooge says as he reflects on Mr. Fezziwig’s generosity. Fezziwig Balls give a chance for guests to enjoy the joys ofthe holidays, but balls in the Victorian era are better known for their strict guidelines. Preparing for a ball in the 19th century was a grand affair. Several people interested in hosting a ball would form a Committee of Arrangement or Managers. The committee would then find a hall, hire a band, plan the food and invite the guests. On the night of the ball, committee members might serve as floor managers to direct the music, make introductions, and making sure guests have enough dance partners. During the ball, there were many rules of etiquette guests must follow. An unmarried lady was accompanied by her mother or a chaperone, while a married lady came with her husband. Gentlemen could not approach any lady to dance but instead had to be introduced by a friend or the floor manager. A woman could not cross the ballroom floor unescorted and it was frowned upon for a lady to refuse an invitation from a gentleman to dance. Ladies were never to look too interested in the men they were dancing with. In the future, if a gentleman saw a lady he danced with at a ball, he could not speak to her unless the lady chose to recognize him. Engaged couples danced with one another little during a ball, and married couples even less. There was much thought put into the gowns ladies wore to a Victorian ball. A woman would have to dress according to her age and her status as married or single. Gowns for balls tended to be lighter, made with fabrics like tarlatan and tulle. It was popular to wear flowers in your hair, but jewelry was worn sparingly. Ladies wore gloves, either white or dyed the color of her dress, and they were never taken off in the ballroom. An extra set of gloves was brought in case the gloves were soiled or ripped. We look forward to seeing our customers don Recollections gowns and gloves this holiday! Share your photos with Donna. Here are a couple of early 1800s Recollections’ gowns that might have made an appearance at a Fezziwig Ball. Check out our Ball Gowns for your next ball. 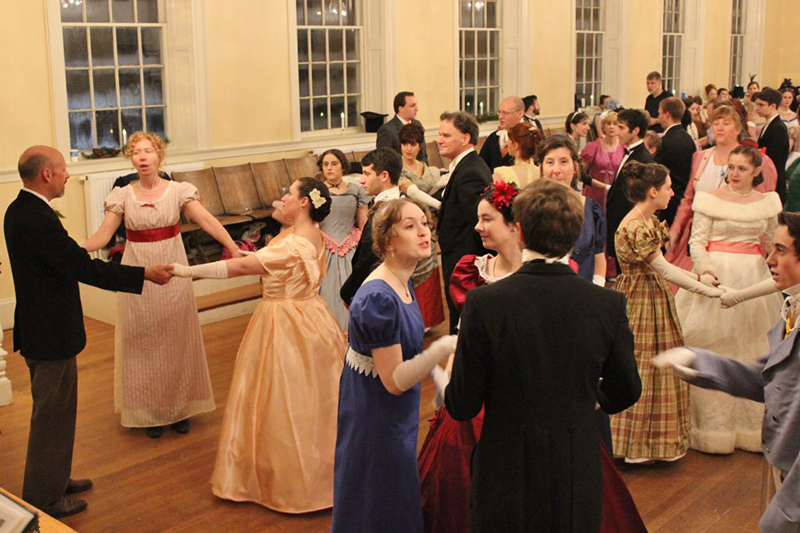 Check out The Commonwealth Vintage Dancers for more historically-themed balls. 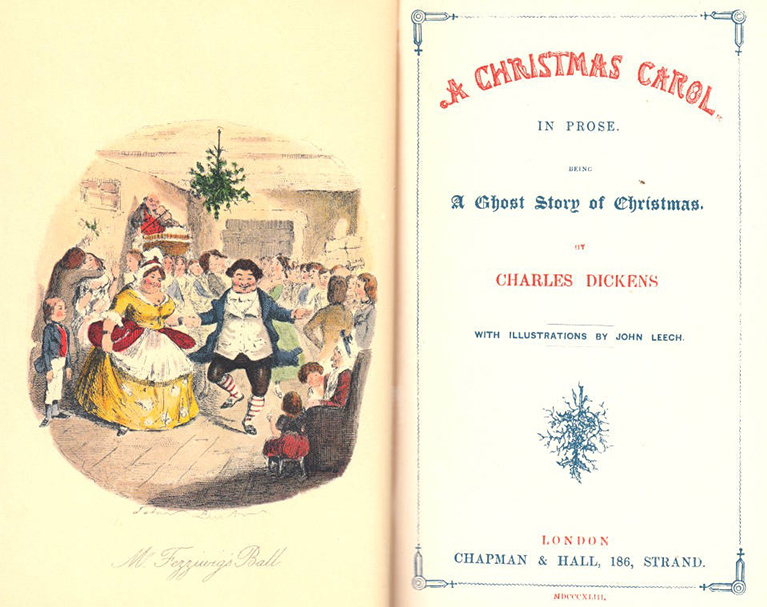 Get into the holiday spirit by reading Charles Dickens’ A Christmas Carol.